China cabinets are items of furniture that are used to store and display special dinnerware and other decorative ceramics. In most instances, the cabinet is made from fine wood and is positioned in dining rooms or kitchens. 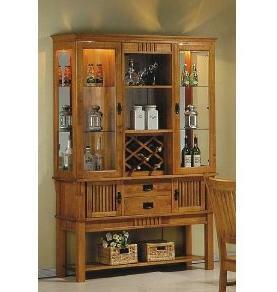 The china cabinet is frequently found in two sections which are joined together to provide an upper and a lower part. Known as a ‘hutch’, the upper section is where shelving allows for the display of fine china and related home-wares. The lower section is in many ways similar to the regular chest one would find in any interior setting such as a bedroom or living room. This section consists of drawers and cabinets with doors which give plenty of storage space for linens, silverware and other bits and pieces one would likely need for a dinner occasion. The design of these lower sections vary depending on the style of china cabinet you purchase. The shelving of the hutch section can be found in a variety of different materials. Completely wooden china cabinets are popular and allow the ceramic plates and dishes to benefit from a natural backdrop. Other shelving materials include glass which means the items on display can be seen from below and above as well as catch the light from a myriad of different angles. The glass shelving of a china cabinet gives the illusion of the china floating in mid-air which can be appropriate in some decor schemes. Many china cabinets also come with doors for the upper hutch section which protect the ceramic dinnerware from damage, dust and even sunlight. These doors are more often than not made from glass which allow for the decorative plates and dishes to be seen despite being closed in. Small plate stands can be purchased which tilt the dinnerware piece and allow it to be seen from the entire interior without the danger of it rolling across the shelf. China cabinets can be purchased in a score of different wood types. Mahogany, cherry and oak are the three most popular and appropriate materials to seek. It’s probably best to stay away from pine wood cabinets if you want your furniture piece to last a long time and become a heirloom. Pine is a soft wood and dents easily. For darker décor effects, mahogany is a good choice, as is dark cherry which actually darkens further with age. Oak is my particular favorite. There are also more contemporary china cabinet designs which rely on an industrial combination of glass and metal. Corner china cabinets are also worth a look. If you have a small interior or are seeking to fill an empty corner with something functional and formal, then these cabinet types are ideal. You can even buy a pair and put one in two corners of the same room. As well as ceramic dinnerware and precious china, you can use china cabinets for other objects such as sculptures, figurine collections, photographs and various hobby items one may like to display for family and visitors to see. 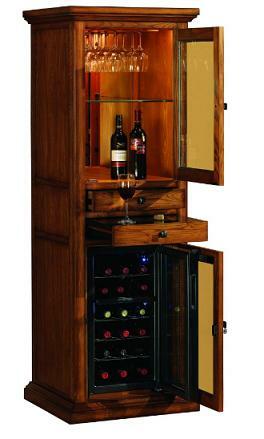 If you’re looking for a wooden wine curio cabinet that will compliment the existing décor in a wine cellar, dining room or kitchen, then this wooden Meridian Wine Curio with an in-built thermoelectric wine cooler might be just what you’re searching for. As one can see from the picture below, this wine curio cabinet has a variety of compartments that will benefit the complete wine storage, serving and drinking experience. The wooden wine curio cabinet is in oak and has a slim width meaning it can be placed in a multitude of possible locations depending on existing placements and designs. Although slim, the thermoelectric wine cooler has been designed to hold up to 18 bottles of wine at varying temperatures. For example, the upper zone of the curio wine cooler is around 10 degrees Fahrenheit cooler than the lower zone. This is important as different wines fare better at different temperatures. What I particularly like about this wooden wine curio and thermoelectric wine cooler combination is how it fits together without looking confused or overbearing. A drawer in the center of the wine curio cabinet, just above the cooler, provide storage for wine bottle openers, place mats and various other small accessories connected to serving wine and indeed spirits. Another drawer opens up to reveal a pull-out granite work-top surface for opening and pouring wine. As one can also see from the picture above, wine glasses are stored in the upper compartment of the wooden oak wine curio cabinet. A wine glass rack keeps the glasses within each reach and access above a space for the display of wine bottles that one might one to show-off to guests before drinking. By the way, the display area has a mirrored back panel which reflects the bottles on display and also gives a sense of extra space both to the wine curio and possibly the room itself. For a family or bachelor that loves their wine and entertains dinner guests on a regular basis, this wooden Meridian Wine Curio with an in-built wine cooler will make a lovely addition to the home. This is especially the case if your kitchen, dining area or basement area has similar oak furniture. It’s a whole home bar in one which makes it both highly functional and at the same time, aesthetically pleasing. On the page linked to above you can see a video of this wine curio in operation. Well worth a watch. 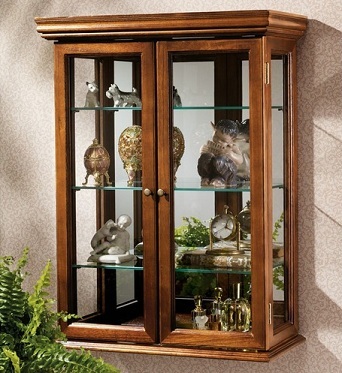 If you’re looking for a storage cabinet in which to show of your best china, figurines or sculptures, then a curio cabinet is what you are looking for. For rooms which are more traditional and old-worldly in nature, then this half round wooden curio cabinet in antique brown will make an ideal addition to the interior setting. This is particularly the case if you want the cabinet itself to be a major focal point of the room. So what exactly is a Curio cabinet? A Curio cabinet is used to present and display precious ornaments, dolls, tableware, glassware, artistic sculptures and collections of items that share a common theme. The cabinets are usually predominantly made of glass although many, like in the case of the half round wooden curio cabinet as picture above, come crafted of other materials. However, each one is similar in that the display case has glass windows which allow easy viewing of the items within. Most curio cabinets have glass on each side of the case whilst others also have a mirror at the back, closest to the wall. A great majority have glass shelving which allow the ornaments and sculptures to be seen from all angles. Curio cabinets are different to regular display cabinets which usually show items from a horizontal perspective. The Curio instead is vertical in order to show standing items such as figurines and decorated boxes. Another main function of the Curio cabinet is to keep the precious objects inside free from dust and dampness, thereby prolonging the quality of the pieces. The half round wooden curio cabinet pictured here is one of my favourites. As mentioned before, it’s ideal for an interior space which is more classical in its design scheme. This Curio comes with two stepped edge glass shelves which are found behind a set of three doors. For great lighting effects, there are also three halogen lights with a step switch. The finish consists of a distressed antique brown with black undertones. 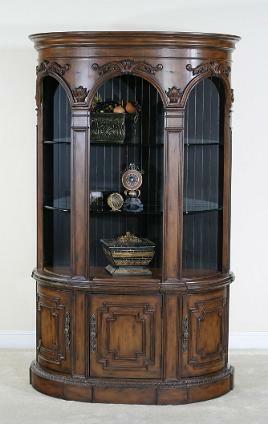 You can buy this cabinet from the following location: Half Round Wooden Curio Cabinet in Antique Brown.